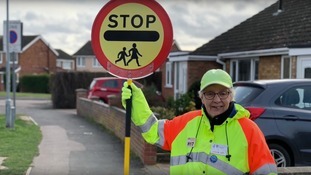 76-year-old Carol Hayes has been named the longest-serving School Crossing Patroller in the eastern region. She has been helping pupils from Priory Park Junior School, St Neots cross the road safely for 40 years. "I am very happy in my role, the children and parents are really nice and I get on well with them...Sometimes I meet people in town, who I used to help cross the road, it's nice to see familiar faces." During her four decade stint, Carol Hayes has helped approximately 1.2 million children cross the road. She wants to continue working as a School Crossing Patroller for as long as possible. "On behalf of the County Council we'd like to extend our congratulations to Mrs Hayes for her 40 years' service - it's an amazing achievement."